What about Winslet? Which nominated performance(s) should have garnered Kate Winslet an Academy Award? I couldn't agree more with the top choice of Sense and Sensibility. 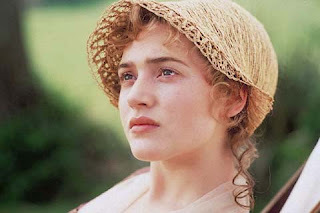 As Marianne Dashwood, Kate Winslet first captured our hearts with her fiery passion and sharp wit. When Willoughby gave Marianne the cold shoulder at the dance, everyone watching could feel the heartbreak which made her "happily ever after" with the gentle, older Col. Brandon (Alan Rickman) even sweeter. While the rest of her performances have been top-notch as well, it's her decision to stay with risky art and independent films she believes in that has made her one of the most fascinating actresses to watch and possibly one whose avoidance of "large scale" blockbusters (Titanic excluded, of course) has cost her a larger fan base but viewers who have been captivated by Winslet in overlooked gems like Eternal Sunshine or Little Children wouldn't have it any other way. In honor of Valentine's Day, the topic of our next poll is Favorite Movie Couples. In crafting the choices, we've tried to include pairs of all types from funny to legendary by celebrating couples that have endeared audiences across generations. Be sure to cast a vote in the next poll and share some of their films with your Valentine. If you're looking for movie recommendations to share with that special someone, click here to visit the Film Intuition list from 2007 .